Age Restrictions: PG - Some risque content from the host. Nothing 'adult'. We advise that this show will suit a wide range of ages, but we request all minors be supervised and kept under parental control with regards to staying seated / talking etc. Celebrating it's 5th season here in Blackpool - this show is our most popular midweek production and appeals to a wide range of audiences and ages. 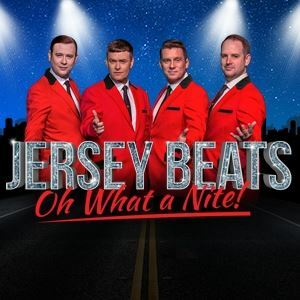 Featuring the music of Frankie Valli & The Four Seasons!This is music with a broad appeal including 'Sherry' 'Beggin', 'Grease' and 'My Eyes Adored you' PLUS more music from the era - so no worries about individual taste or pleasing a big group. Performed by an amazing quartet of vocalists - Matt Andrews (Frankie), Johnny O'Connor (Nick), Toby Beal (Tommy) and Michael Cosgrove (Bob) - the show appears with a fabulous troupe of showgirl dancers and full production including video. You'll enjoy plenty of comedy, music and moves in a fast moving show - starring our hilarious host Leye D Johns, resident Viva Showgirls dancers. It's a full night out, with a show lasting for around 2 and a half hours with an interval - your whole evening is sorted!